The two day Bandh (market shut down) called by traders against sealing of illegal shops seems to have backfired on the traders and shopkeepers of Delhi. The closing of shops, most of which protrude out all the way to the road, after covering the entire footpath, has now enabled the citizens of Delhi to see spacious roads and usable footpaths for the first time. 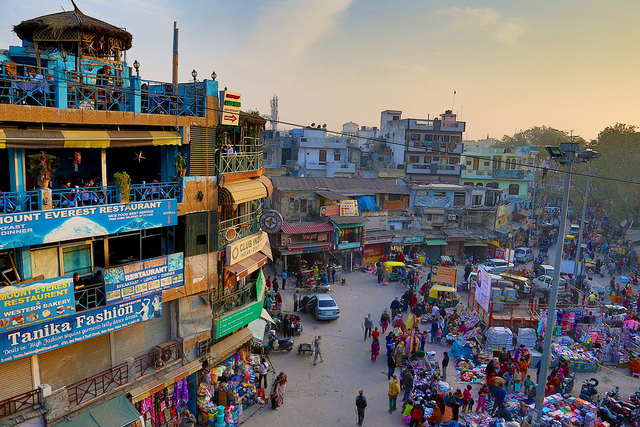 The market places in all parts of Delhi, North, South, East and West have never been as accessible, and the limited shops that have opened are doing brisk business. Most shops in Delhi have, by habit, taken over the areas around the shops for putting containers, generators and for displaying items for sale. Since shopkeepers are scared of this being exposed, they have hidden all this inside their shops and have downed the shutters. Citizens who live near these market places such as Central Market, Sarojini Nagar, Karol Bagh, Kamala Nagar, etc. are particularly happy since they have never felt more peaceful and relaxed while moving in and out of their houses. Priyanka Gupta, a resident of Karol Bagh – where the streets have been empty and the footpaths cleared of all the items dumped on it by the shopkeepers – is delighted. “I could never imagine that the road next to my house was actually this big,” she shared her excitement. A news clipping (in Hindi) warning against the dangers of stopping the sealing and highlighting the disastrous impacts of illegal construction on the people of Delhi. The closing down of illegal double and triple floors constructed on top of shops has also helped greatly in reducing the congestion on the roads and on the footpaths. Interestingly the Air Quality Index (AQI) of Delhi has also come down from Very Unhealthy (Red) to Unhealthy for Sensitive Groups (Orange), as markets remained shut for both yesterday and today in the city. This is an indication of how adopting legal measures of doing business by shopkeepers in Delhi could help reduce Delhi’s pollution as well. “I hope the roads of Delhi remain as spacious and the footpaths remain free from encroachment so I can walk on them without bumping into anything,” said Pragya Sharma, a student of Hans Raj College (DU) after walking through the Kamala Nagar market. The media has also been reporting about the fact how the sealing drive in Delhi is actually a step ahead in the proper development of Delhi, and how the blackmailing by the traders is a regressive step.